January 26, 2014 February 27, 2014 filipinocavedivers Cool Stuff! Much have changed since the discovery of the Pawod Underwater Cave System in 2001 by FCD Doc Amores. These are testaments to the Pawod’s status as the birthplace of the burgeoning culture of cave diving in the Philippines. The cave is now home to a few cave training programs; it has graduated more than a dozen cave divers to date. Concrete blocks placed inside the Pawod Cave without coordination with the FCD or with the LGU. An undesirable consequence to the activities in Pawod is the presence of many “permanent” lines due to uncoordinated placement by different cave training schools. Fig 1. White and yellow highlights represent existing lines with corresponding compass bearings (FCD Jaime Lapac) from the survey done on September 4, 2013 by the FCD team of Doc Amores, Andy Berame and Jaime Lapac. Figure 1 above shows the haphazard placement of lines that appear confusing to those divers not familiar with Pawod. To remedy this, FCD, in conjunction with Barangay Agus and Lapu-Lapu City CENRO (City Environment and Natural Resources Office) is embarking on this relining project. The aim is to simplify the lines. Those cave training programs who wish to lay lines for training exercises such as line laying, line jumps, etc will then have to lay additional lines on a temporary basis. At the end of the exercise, these temporary lines should be removed by whoever laid them. If lines are left more than 24 hours, the Barangay will need to be notified or else the lines will be taken down if noted during an FCD dive. Figure 2 below shows the final permanent lines (in yellow). 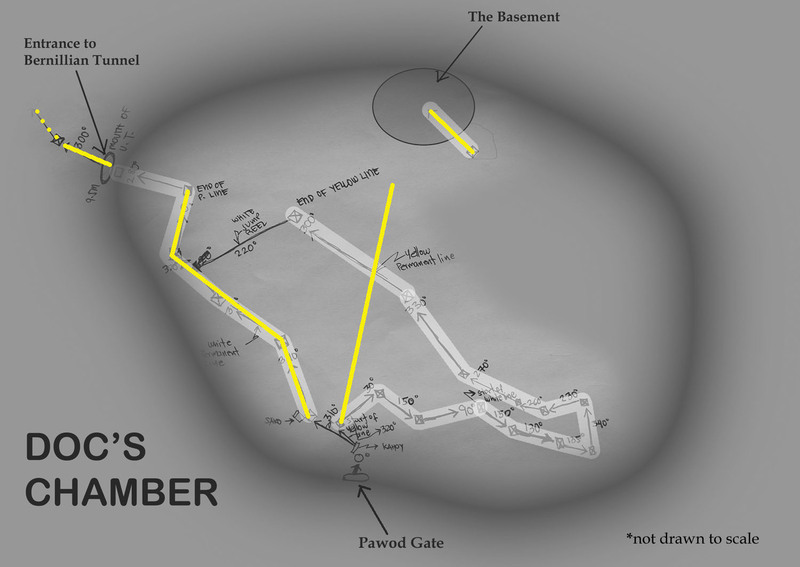 These include the two lines in Doc’s Chamber, the short line going to the Basement, and the line in Bernillian Tunnel.